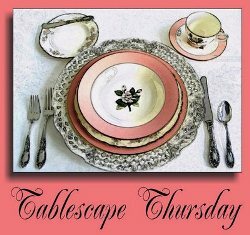 Welcome to the 445th Tablescape Thursday! I’m back home! Enjoyed my time in Morocco but there’s definitely no place like home. When traveling, it seems like every time you turn around it’s time to eat again, not that I’m complaining! Trying new foods is definitely one of the best parts of travel. 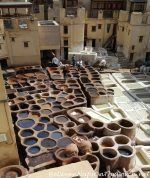 On Saturday, March 18th, we explored Fez, a place our guide-book states is often considered “the world’s most well-preserved medieval city.” It’s also a UNESCO World Heritage Site. If you followed BNOTP on Instagram over the last few weeks, you may remember seeing a few photos I posted during our time in Fez. Later in the day we stopped for lunch in one of the prettiest, most elegant places we ate during our entire trip. This was a view of one end of the room. The room was quite long and narrow and the other end was pretty much the mirror image of this end. Our group of fifteen settled in at the tables at both ends of the room. I didn’t have a chance to lighten these photos this morning since I got in so late last night. It was pretty dark and cozy in the room anyway, so you’re experiencing it very much as we did. One of the things I most missed while gone was just being able to turn on a faucet for a glass of water. All the reviews of this trip warn about drinking the water in Morocco. Our guide said that it’s not always the water that creates a problem for those visiting, that sometimes it’s the chemicals that are used to clean the water. In any case, we were always given bottled water when dining. I tried to take a photo of the back of the plate, but it was too blurry to read when I looked at it later. The only thing I remember now about this pattern was that it wasn’t by any brand/company I recognized and I don’t remember seeing a “pattern name” for the dishware. The red and white pattern is really pretty. We were given embroidered napkins in several of the restaurants where we ate. I almost hated to use them, wondering how they would get the food stains out later without fading the pretty stitchery. 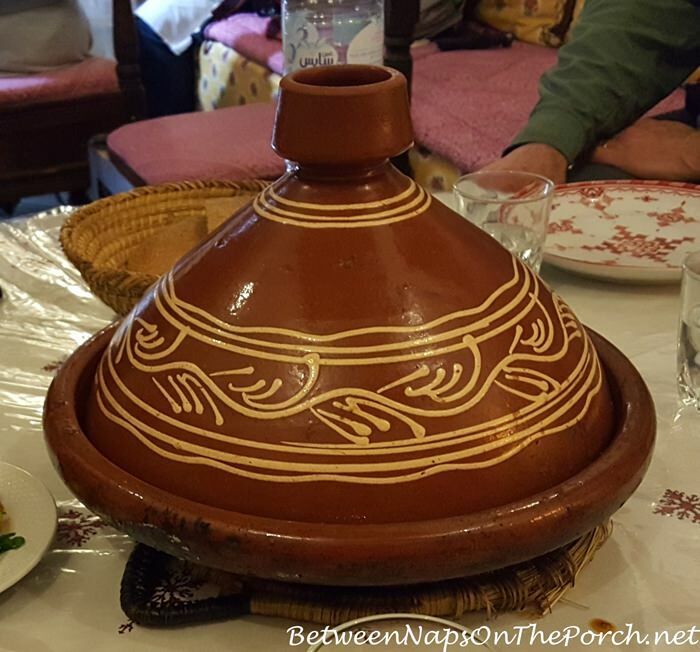 Many of our meals during this trip were cooked and served in a “tagine” an earthenware pot that is often used for preparing a meal in Morocco. Tagines, when purchased new, apparently take a bit of time to “season.” Hearing that reminded me of the iron skillets that southern cooks often use for preparing cornbread. A new iron skillet just doesn’t work like one that’s been cooked in many times over the years. Many of the folks in our group who like to cook, wanted to buy a tagine to take home with them, but they weigh a ton. Someone mentioned they are available online. 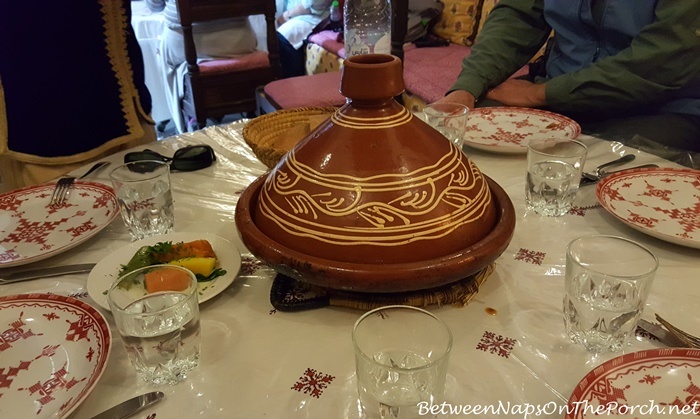 I looked this morning and found some here: Tagines and here: Tagines. 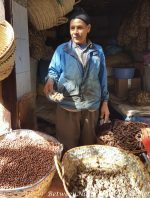 There are also cookbooks online with recipes for cooking in tagines like this one: Delicious Recipes for Moroccan One-Pot Cooking. Have you ever cooked using a tagine? The design of the tagine is supposed to help keep the food moist and flavorful. I’ll see if I can find the photos I took of the meal we had and add them onto this post or share them in a future post. Thanks for sharing your trip- it’s so interesting! I wanted to let you know that I purchased the Teva Delvina boots you recommended and they are perfect! Waterproof and feel great for walking! Wish I’d gotten them earlier, but they will be great for next fall. Thanks for the recommendation! No, the safari was definitely better, but this one was less expensive and longer. They were both so very different, so hard to compare them to one another. Thanks, Lena! I’ll write a post explaining more about the trip soon. 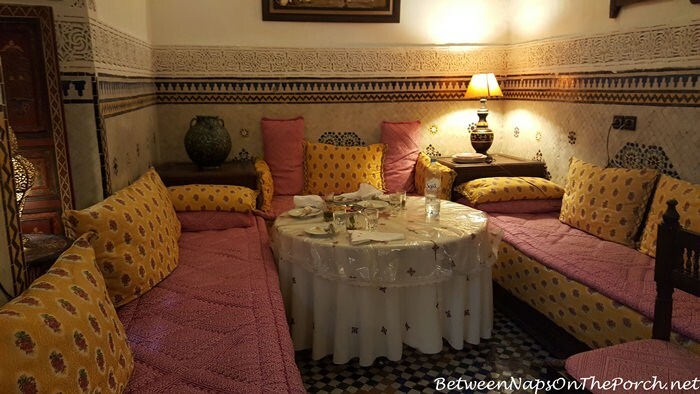 The Moroccan table is very handsome. It looks like both the tablecloth and napkins are hand embroidered. The dishes look like they match perfectly. Yes, I think they both were, really pretty! It looks so cozy in that setting–very relaxing and appetite inducing. 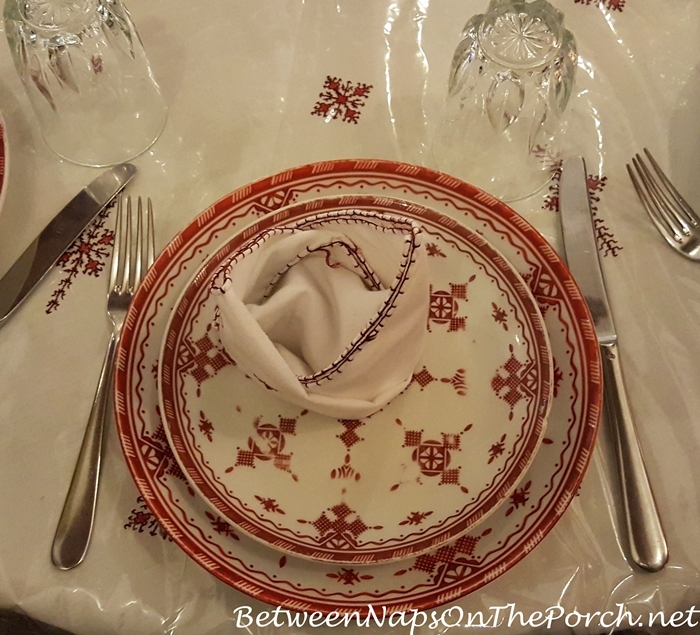 Love the tablecloth pattern and how it radiates out to the placesettings. Did they serve wine also? Great adventure and thanks for sharing as many IG photos as you could. Not for this meal. We did have wine with a couple of meals, though. Thanks, Mia! It’s really good to be back home! Welcome home! Pretty dishes & linens. Thanks, Rita! Glad to be back! What a charming place to dine. Love the plates and the linens. Thanks for sharing this unique experience, and thanks for getting TBT posted in spite of your late night. Of course, I meant TST! What a beautiful table! 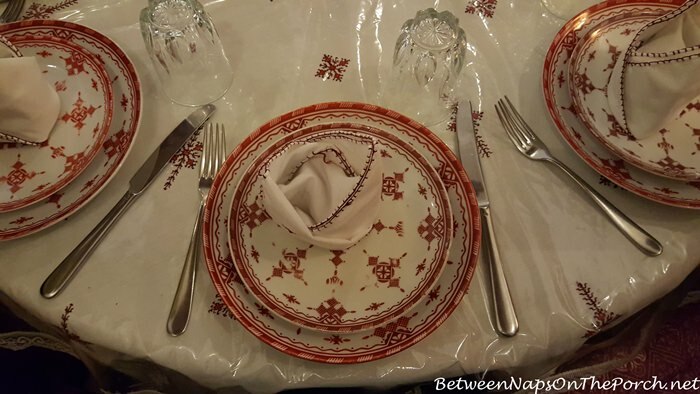 I love how the plates perfectly match the linens.That must have been an amazing trip! Fez is one of u favorite places. We visited several times while living in Germany. 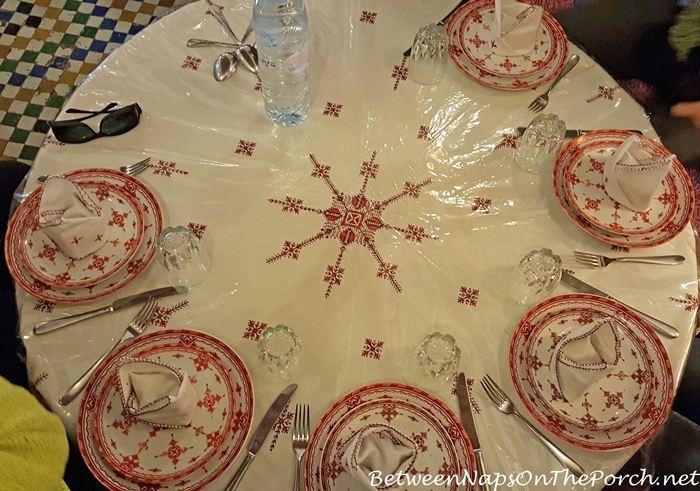 We bought a tagine the first trip and took cooking lessons the second time at our riad. They cooked everything in the pressure cooker and served it in the tagine. Also, those beautiful napkins are done by ladies in the area. I bought placemats with that design because I couldn’t buy the napkins for the very reason you talked about! Fez is definitely an interesting place! So happy you posted this! It’s interesting to see the details from another country…those napkins especially caught my eye and I love the full shot outside! Where is the next journey? Not sure, I was thinking of a trip here in the U.S. somewhere. I’d love to see Martha’s Vineyard or some fun beaching place this summer. Do you have any vacation plans, Nancy? I love those plates. I fell in love with Middle Eastern cuisine when I lived in Bahrain. I don’t currently have a tagine, but would love to get one. The dining room looks so cozy and isn’t that Pierre Deux fabric on those cushions? Whatever it is, I love it! I’m not sure…it was very pretty! Those charming red dishes caught my eye right away!!! Glad you had a good time and are home safely….. Welcome home, Susan! What a thrill it must be to travel to such an exotic part of the world! I loved the dinnerware and linens you shared. Can’t wait for more details about the things you saw and did. One of your shots on IG looks like you got to ride a camel! Not quite your Peloton cycle, huh? LOL. Take care and drink lots of water to combat the jet lag. lol No, definitely not like my Peloton. Ha! I’ll have to share a post about that adventure. 🙂 Thanks for the reminder about the water…great idea! I love your trip photos and it’s so nice of you to share them with us. I’ve never had a meal prepared in a tagine but I’ve always wanted to buy one. Thanks for hosting each week. Our guide kept saying to not buy the ones that were decorative, that they were for display only and that you couldn’t cook in them. I want to do a bit of research on them and see if that’s true. I liked the ones that were painted blue and white on the lid. It’s likely the lead in the paint that makes the decorative ones unsuitable for cooking. I’m sure you already know this, but you have to be really careful about that when buying from countries with more “liberal” health regulations, shall we say?? But they’re gorgeous and soooo tempting. I’ve made tangines, and debated buying the actual container from Williams Sonoma. I find you can use a cast-iron braising pot and get the same results. Not as pretty, though! Susan, I so admire your dedication and intrepid spirit in posting under less than ideal conditions. As a reader, I’m very grateful for your energy and enthusiasm. I hope you recover from the jet lag soon. Morocco is one of my all time favorite trips. I was crazy about the food and the way it was presented. I see you appreciated it as well. Really enjoyed your pictures and description of your trip. Sounds wonderful. I bought a tagine from Le Creuset. Very practical . The base is also great for searing meat. I had not heard of Fez. It is interesting to read about your travels to exotic places. Now you will have to watch the movie The Man Who Knew Too Much with your favorite Doris Day, the movie took place in Morocco! Glad you are safe at home. Anxious to hear more details of your trip. Thanks, Barbara…I’m glad to be back sleeping in my own bed. The placesettings are beautiful as was the room! Such a wonderful experience! Glad you are home! Welcome home, Susan! So glad you had another great trip! Thanks again for hosting. The tangine looks so heavy. I will be looking up how to cook in it, very interesting. The whole room looks so pretty. We had beautiful linens that my mother embroidered and crocheted I have some of them and still use them. Though the colors may have faded a little they still look good even after 50+ years and very much bleach. 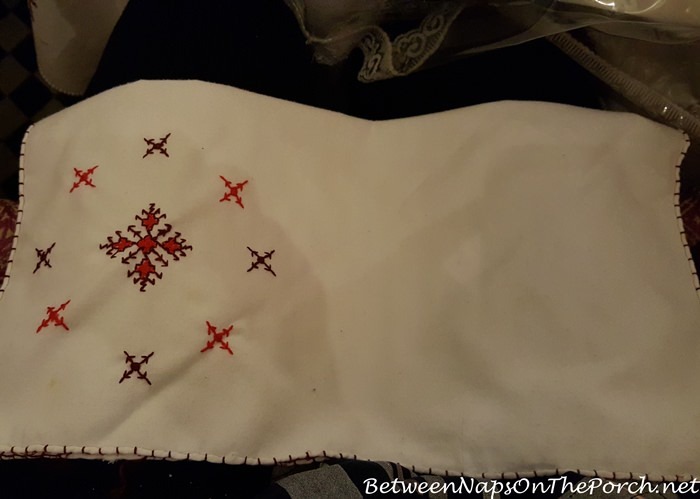 The old cotton fabric and threads held up very well. Welcome home! That’s awesome, Theresa! I know your Mom would be so happy to see them being used. Love that! Happy you made it back safely and had a great trip! Thanks for taking us along! The tablescape and linens are really pretty! I really enjoy your posts! Glad to hear you’re back home safe and sound. Sounds like a wonderful trip. The seating at the restaurant looks posh and cozy. It’s fun to travel, but I know what you mean about coming “home”. Whenever we get back from a trip, I walk around the house just glad to be among familiar things that make me feel warm and fuzzy. Everything is in bloom up here and really starting to look so pretty. Hugs! Happy Spring, Bobbi! Love this time of year, except for the messy pollen. lol Yes, it feels wonderful to be back home. Feels like I was gone forever! use a dutch oven if you didn’t have a tagine dish. I have done that many times, and it works perfectly. The tagine dishes are lovely, but take up too much room. Maybe some day. Looking forward to checking out those recipes. Thanks, Cheryl! My storage is pretty limited so that’s good to know! I do have a Dutch Oven so will keep that in mind. Welcome Home!! I’ll have to check out Instagram and see those pictures – had a busy week and didn’t get a chance yet. Well, now you can scratch off one more country on your world map! Did I tell you, I purchased one of the great USA and I’m pleased to see that I only have the east coast – New England and the Carolinas and what I call the Big Sky states – Montana, Wyoming, the Dakotas, Minnesota and Hawaii to see. It is thrilling and so glad you told us about these maps. Traveling is fun, but “Dorothy” / Susan, there is no place like home!! Especially one with a great screened in porch! ha. Glad you are safely back home and that this trip was a wonderful experience. I think Morocco is exotic and beautiful. Very different experience for me when my typical travel was to France or the UK. Your experience covered more territory. So happy for you, Susan! Thanks for sharing all your photos. I specially love the china. Thank you for the party Susan. You look like you had an awesome time in Morocco. Susan, somglad you are home safe and I am sure jet-lagged! Morocco seems like a very exotic destination. Can’t wait to hear more about it, love your IG photos. The linens are lovely and I know you enjoyed the food! Rest up this weekend! Oh my that is beautiful. So beautifully feminine and attractive. Can’t wait to hear your stories. Any double dipping on the tangine? Never knew that word – your blogs are an education. On my trip to Asia – when in group settings, I wasn’t thrilled about my travelmates “double dipping” in the communal platters after they had eaten off their silverware. For some reason a big serving spoon never appeared so I made sure I got what I wanted the first time the plate was passed around while everyone had clean utensils. I try not to sweat the small stuff but that irks me. I just tried to look on the positive side that after traveling a couple week with strangers, they all become family anyway even if for just a short period of time. Teresa, you and I would do well traveling together because I don’t like that either! There was one meal (thankfully it was only one) that I wouldn’t even eat because it was served on one big platter and we weren’t given plates at all. Everyone at my table (there were five of us) was supposed to eat off that same platter…and I do mean EAT OFF OF IT, placing our bones back on the platter. I think they served lamb, don’t even remember now. It had been cooked in this big hole in the ground. It was supposed to be a special meal because the place we were eating was THE ONLY place in the country that still had those huge cooking ovens in a hole in the ground and could still cook that way. But I still wouldn’t eat it. I just couldn’t eat off a single platter with everyone else. If they had given us plates so we could eat off our own plate, I probably would have tried it, even though I didn’t like the looks of the hole in the ground. They served one plate of vegetables the same way and everyone was eating with their forks off the plate. I asked for a small plate so I could serve myself some vegetables. Instead, they brought me out a big plate of vegetables. I scrapped most of them into the other plate of vegetables that was for the table, keeping some for myself. So, yeah, I’m not a fan of double dipping either! Ha!